The abundance of vegan-friendly options now available in grocery stores is a delight to compassionate people everywhere. From soy burgers to artificial eggs, the only thing missing was meat-free seafood... until now. 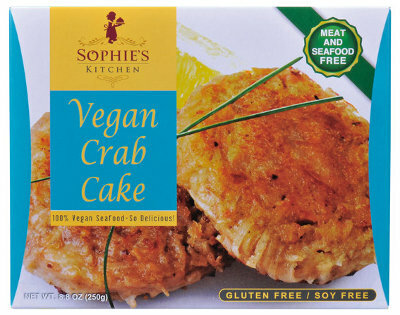 One of my favorite offerings from Sophie's Kitchen is the vegan crab cake. The product is made with Elephant Yam Root (Konjac), a plant found in Asia, to mimic the consistency of seafood. Besides the spot-on consistency, the vegan crab cake is incredibly seasoned, making it an irresistible treat for the taste buds. Sophie's Kitchen products are available in natural food stores across the country. For more information or to order Sophie's Kitchen online, visit the company's website..